The Infrared imaging microscope uses a Bausch and Lomb Microzoom Microscope. There are 4 objectives of 2.5x, 5x, 20x, and 50x magnification with eyepieces of 15x. An IR camera displays images on the monitor. 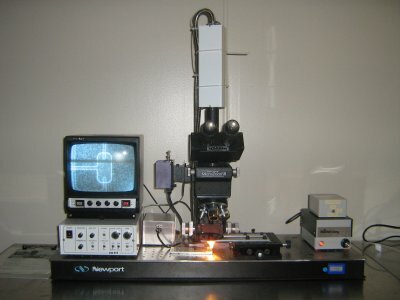 A stage with micrometers can be used for precise sample movement. The lamp power can be adjusted to alter imaging contrast.